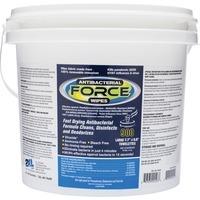 GymWipesCareWipes Antibacterial Force Towelettes are perfect for controlling and eliminating organisms on high traffic surfaces that people come into contact with every day. Disposable, full spectrum disinfectant wipes are EPA registered and hospital grade. They are an easy, hygienic way to lower the risk of infection and cross contamination. One step wipes require no bottles, sprays or packets. Simply pull from the Clean As You Go bucket to maintain a healthy, sanitary environment. Soft, durable towelettes are nonirritating, nontoxic and nonabrasive. Self dispensing bucket contains 900 super absorbent wipes 8 x 6.